What If You Don’t Start? Many of us know the feeling: it’s Thursday already and you still haven’t started the thing that you promised yourself you’d do on Monday. You feel unhappy, guilty and mad at yourself for having procrastinated once again. When you procrastinate, you don’t function according to your potential. You might feel anxious. You may struggle to cope with everyday situations. Trusting yourself becomes difficult if you constantly let yourself down. And, if you can’t trust yourself, it can be hard to trust others. In the workplace you might come across as lazy, unreliable, and unambitious. This is likely untrue, but if you’re constantly procrastinating that’s how your colleagues will perceive you. How are they to think differently about you if that’s what they see? Procrastination can also cause stress, and prolonged periods of stress can have a negative impact on your mental health, your overall satisfaction with life, and your physical well-being – hypertension and cardiovascular disease, for example, are conclusively linked to stress. When you don’t start something that you’ve been meaning to do for a long time, it can drain your energy. You might be able to justify it, because we can all talk ourselves into and out of things very easily. Yet all the talking and explaining in the world won’t get anything done – you have to get started. And, the moment you start, you also start to think differently. The way you think has a huge impact – you’re able to create new energy simply by breaking the “spell” of procrastination and focusing on the task at hand. We all love getting something right and experiencing the feeling of accomplishment. And, while you might not feel it immediately, your future self will be grateful that you started that fitness program, changed your eating habits, got more sleep, kept your admin up to date, or whatever it might be. Just imagine how you’ll feel if you start. And then think about what you’ll choose to start today. Q1. What are some of the things that you keep meaning to start, yet haven’t? It was interesting to see how many people wanted to start (or restart) doing something creative. It seems we’re so busy with the things we must do that we don’t get to the things we want to do. @MarkC_Avgi Umm… besides some of those things on the “honey-do list”? 😉 Considering this is #NaNoWriMo18, there is some writing and my blog that really needs some time and attention! @DrRossEspinoza It has been about restarting: swimming, writing blogs. And about starting: setting up a business, do a serious Lego play business. Q2. What tends to stop you from moving ahead and getting going? @Limha75 Overplanning overplanning overplanning… listing and general knicker-twisting. @Mphete_Kwetli Freeing my schedule, and lack of motivation to do it. Not knowing exactly my standpoint on when it’s the right choice to say no to myself. Q3. How do your mood/emotions affect whether you start or put off an activity? Many people shared my view that guilt plays a role: we feel guilty if we’re not working, but spending time on a “want to do” activity instead. @GenePetrovLMC Emotions and mood can definitely be a factor. But I like to remind myself that I have control over those. So I tell myself to get in the mood 🙂 Doesn’t always work. In those cases, listening to music or an inspiring podcast can help to clear a negative mood. @JusChas I suffer from anxiety. But I’ve always been a creative person. I visualize much, but lack the energy to act. Q4. What is your biggest motivator to help get you going? @BrainBlenderTec An idea, and often it snowballs from there. @SayItForwardNow I am very motivated by deadlines, especially those that involve a commitment to others! Q5. What one thing are you willing to start doing TODAY and not a day later? @s_narmadhaa said, “Getting more sleep.” It sounds simple, but many people are sleep-deprived and can’t operate according to their potential. @TwisterKW Downloaded a trial version of software I’ve been meaning to try and teach myself. @B2the7 To start taking exercise more seriously and to get into better routines each day. For myself, that morning routine is important for starting the day off right. Q6. What’s your “why”? Why will you start today? @ZalkaB There’s no better day than today. And then every day. And when you make time and effort to create new micro habits, it all falls into place. Q7. What can you do to remain focused on your end goal? @_TomGReid It is mostly a matter of will to meet goals I’ve set. Once I set them with deadlines, I focus and discipline myself to meet it, if it is in any way within my power. Thus I’m careful with the goals I set. A commitment, even to yourself, reflects your character. @Irish_IreneB Remember why you started and have that end goal in sight. Q8. Who will you be accountable to, and how? @goiuby My community and clients. My wife is OK with any job I have, so I don’t hold my self accountable to her, but my clients depend on me. As does my community that I’m a part of! @Midgie_MT I will find an accountability friend to send a daily message to, confirming that I have taken those 10 minutes a day. Q9. How can you reward your “small wins”? @shruti12d Do things that make you happy. Buy a book. Take time to go for a walk and reflect. Treat yourself to a nice coffee. Reward small steps or wins so you stay encouraged to carry on. @harrisonia After “swiss-cheesing” my project tasks, I reward myself with a break, sweet treat, or sometimes keep working because I see the light at the end of the tunnel! Q10. How can you support others who have things on their “want to do” list? @Yolande_MT Be their biggest cheerleader. You might be the only one they have. @MicheleDD_MT Lead them through a visioning exercise to paint a picture of what success will look like for them if they start and complete the task. Some people are great at starting, but they’re not so great at finishing. They struggle to persist and persevere until they reach their goals. 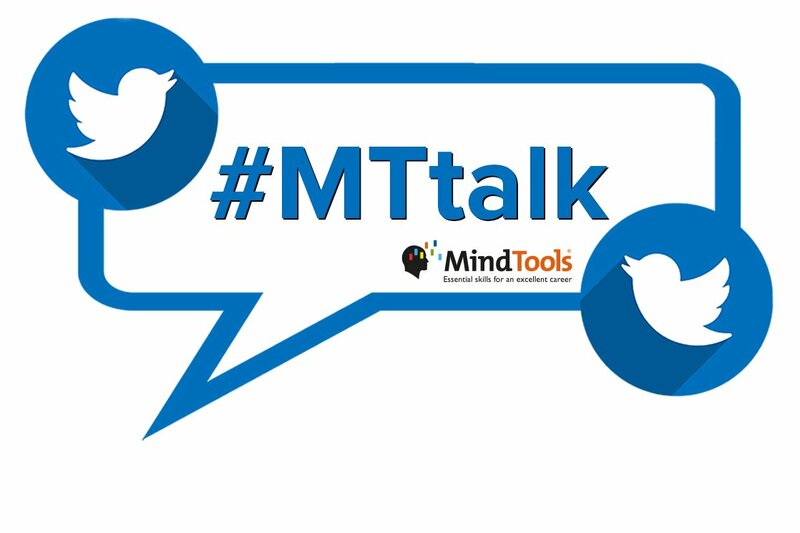 In our next #MTtalk, we’re going to talk about persistence and perseverance. In our Twitter poll this week, we’d like to know what you find it difficult to persevere with. Please vote in our Twitter poll, here.